Tinting Colorant, Low VOC, Yellow Oxide, 1-Qt. Tinting Colorant, Low VOC, Lamp Black, 1-Qt. Tinting Colorant, Low VOC, Red Iron Oxide, 1-Qt. Tinting Colorant, Low VOC, Brown Iron Oxide, 1-Qt. Tinting Colorant, Low VOC, White, 1-Qt. Tinting Colorant, Low VOC, High Intensity Yellow, 1-Qt. Tinting Colorant, Low VOC, Magenta, 1-Qt. Tinting Colorant, Low VOC, Permanent Yellow, 1-Qt. 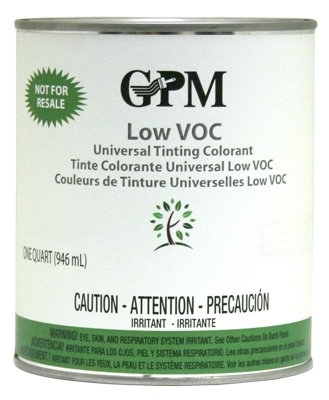 Tinting Colorant, Low VOC, Phthalo Green, 1-Qt. Tinting Colorant, Low VOC, Phthalo Blue, 1-Qt. Tinting Colorant, Low VOC, Raw Umber, 1-Qt.